The new HD 200 Sport RS is the latest addition to Four Winns’ recently expanded lineup, and it is one hot looking boat! 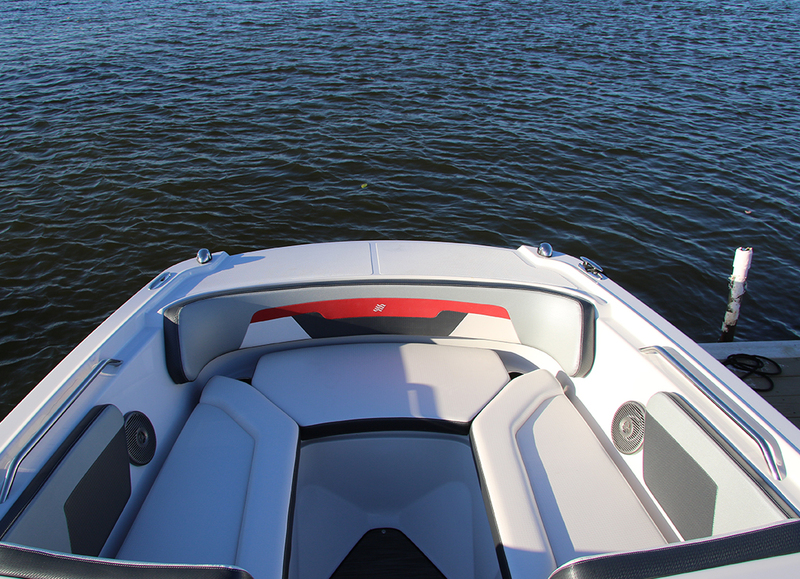 This 20-foot deck boat has the same large round bow found in the HD series, with integrated stainless grab rails and a big wrap around forward backrest. The RS packages adds beautiful, textured multi-coloured vinyl upholstery throughout the boat. The cockpit layout consists of two bucket seats with flip-up bolsters and an L-shaped lounge with storage below. Premium snap in vinyl reed flooring is standard and adds comfort under foot. A large, wide sunpad with hinged cushion to starboard flips up allowing access to the swim platform without having to step on any upholstery. The platform is covered in soft non-skid EVA foam, as is the optional extension. 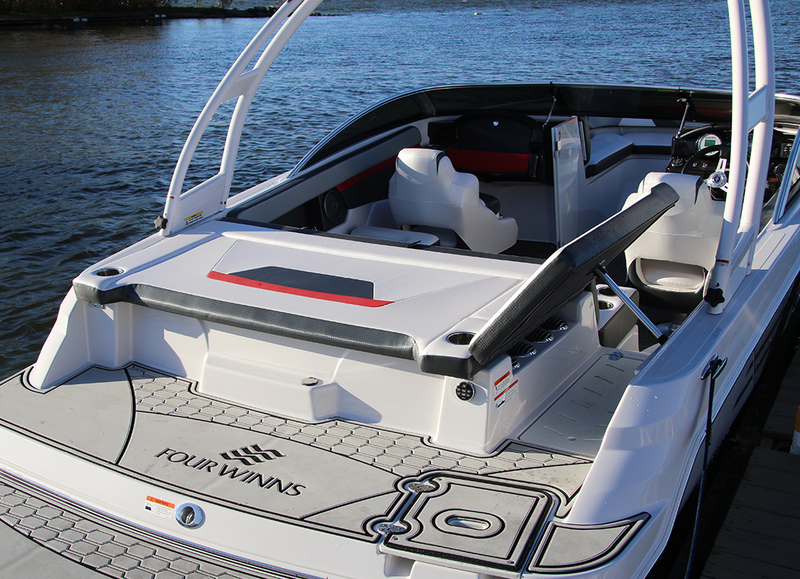 Our test boat was also equipped with the surf package and wakeboard tower. Available with stern drive or outboard power, our test boat had Volvo Penta’s 280 HP V6 with Forward Drive. This drive system puts the propellers about 27 inches further forward than in traditional stern drive set up and vents the exhaust under the water, making it safer for wake surfing. The surf package includes ballast, Zero Off GPS speed control and monster Wake Worx surf tabs. 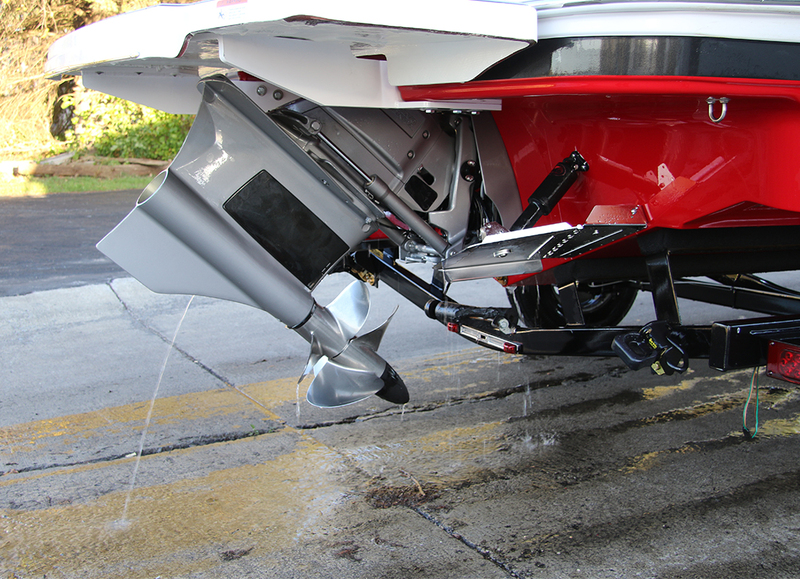 The prop location under the hull also changes the pivot point of the boat, dramatically changing the handling. Instead of pushing from behind the boat, the Forward Drive pulls from much closer to the middle of the boat, so combined with Four Winns’ patented Stable-Vee hull, the result is some very impressive control. No matter how much wheel I gave her, I could not get the propellers to ventilate. With 40-knot winds picking up decent waves I expected to get wet while cranking and banking, but the HD hull has huge reverse chines to keep the spray well away. With the versatility and handling of Volvo’s Forward Drive, you can add Four Winns to the list of surfable boats.